No matter who you are or where you live, you can be sure that some type of weather is going to happen every day. It may be sunny skies and balmy breezes or a cool, crisp day in the fall. But there always lurks the potential for severe weather –thunderstorms, high winds, hail, tornadoes, sleet, snowstorms. On the other end of the scale lie excessive heat, drought and the potential for wildfires. Although most of the disasters we face in Kansas are weather-related, there is also the possibility of a manmade disaster -- a toxic chemical spill, explosions, biological threats and more. On these pages you can learn how you can answer that question “Yes” by making a home emergency kit and devising an emergency plan for your family. Click on any of the links below to get started. First, make a plan. Decide what you would do in case of a fire, a tornado, a flood or other emergency. How will you get out of the house? Where will family members meet to ensure everyone is safe? How will you contact those who are not at home? Once you have the plan devised, make sure everyone knows what it is and practice it. CLICK HERE for a checklist to help you make your plan. Now, make an emergency kit. Commercial kits are available or you can assemble the components on your own. 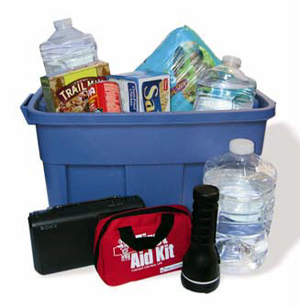 Creating a disaster/emergency kit is not difficult. When stored in an easy to carry container, it provides food, water and all the other essentials you and your family need to sustain yourselves for 72 hours. What hazards do we face in Kansas? Take the Kansas Preparedness Challenge. You may win a prize!